10 years ago when my husband and I adopted a puppy, we began to detox and simplify our home. 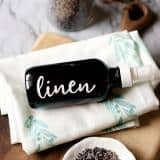 Concerned about all the harsh chemicals in our household cleaning products we began our journey to natural living with these green living essentials. I’ve found that keeping things simple not only is safer for our family but saves quite a bit of money. I know sometimes it can be hard to see the big picture, especially if we are just making one natural recipe at a time. Which, is perfectly OK. In fact, I highly recommend you replace products in your home as you use them up. For example, when you use the last of your commercial dust spray, make Lemon Cedarwood Dust Spray. Use it and when you run out of another cleaner, make it. Instead of trying to overhaul your entire cleaning closet at once. The later could likely lead to overwhelm and cost a lot upfront to make. As you start to make more household cleaners and natural skincare products, you will begin to see the big picture. Which is, most basic ingredients overlap into creating multiple products. Another wonderful thing about sustainable, green living is having less waste! You’ll be surprised at how slow your rubbish bin will fill when you stop buying paper towels! Microfiber towels work so much better for cleaning anyway. And cloth napkins can feel like a luxury, even if you make them from fabric scraps or traditional flour sacks. 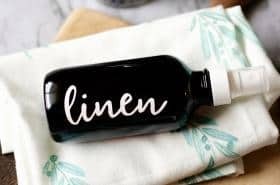 Glass jars, such as mason jars and glass bottles which you can top with spray nozzles or pumps, can be reused time and time again. 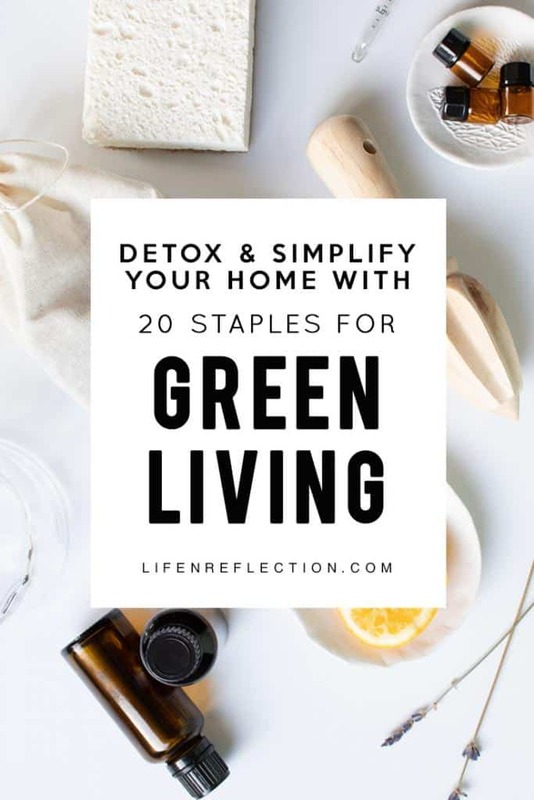 I compiled the list below of 20 must have green living essentials as a guide. I’ve included a link where possible for reference. You’ll need a variety of cleaning spray bottles to overhaul your cleaning closet. 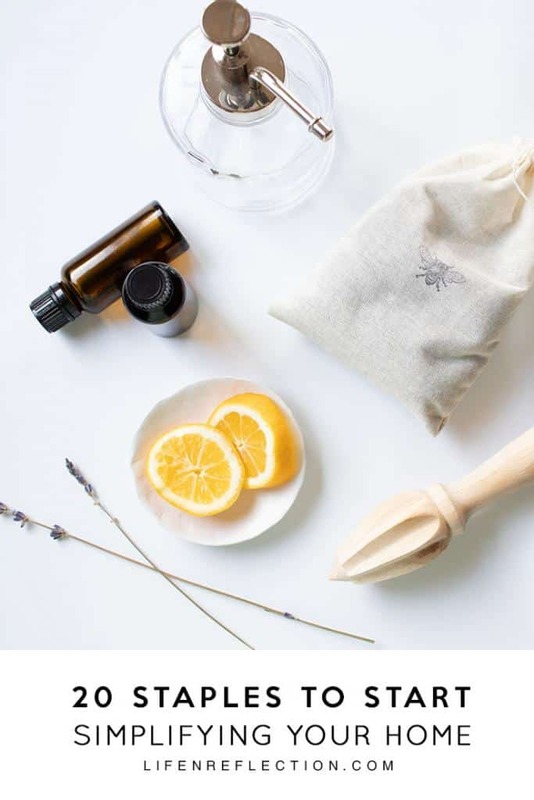 And if you are planning to include any citrus essential oils, such as lemon essential oil in your DIY cleaners you’ll want to use glass bottles only. This starter set of 15 amber glass bottles is the way to go! If you’re going green then, it’s time to stop the paper waste. That’s right no more paper towels or wipe cleaners. Believe it or not, you’ll save money by picking up just one set of microfiber cleaning cloths or 100% Natural Cotton Dish Towels. 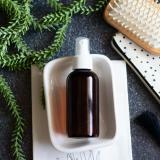 Castile soap is a concentrated vegetable-based soap made of ingredients you can actually pronounce. This soap is gentle on skin and effective against dirt, grease, and unwanted germs. Castile soap can be used to clean just about anything and everything: your face, your shower, and even your dirty dishes! Yes, I’m a fan!! Baking soda, also known as sodium bicarbonate, is a naturally occurring substance. Best known for its use as a scouring agent and odor absorber. Baking soda is also used in cleaning recipes to fight against dirt, grease, and odors. This clean agent alone is a must-have for your cleaning arsenal, I buy it in a one pound bag here. 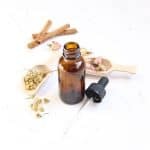 Essential oils not only provide a wonderful natural fragrance to homemade cleaners but also contain powerful disinfecting properties. 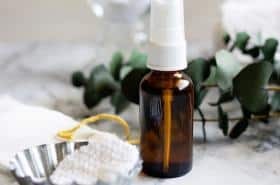 If you’ve been wanting to learn how to clean with essential oils, read more here for tips on choosing the best essential oils to clean your home naturally. Reduce plastic waste by using glass pump bottles for practical everyday use. Fill them with natural hand wash and lotion to keep at your bathroom and kitchen sinks. I use one for my DIY aloe vera face wash too. Vinegar contains 5% acetic acid that fights against bacteria on your surfaces. Although, because vinegar is acidic, it can cause some etching on granite, marble, or stone surfaces. Test it an inconspicuous area or substitute rubbing alcohol for vinegar when needed. 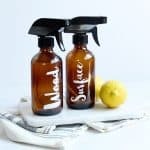 Regardless of its limitations vinegar is a great all-purpose tool for your natural cleaning toolbox. Body butter comes in a variety of textures rich and thick, soft and creamy, each with purpose and benefit for the skin. They are all from natural sources such as kernels and fruit trees. Body butter can be used in soaps, lotions, lip balms, body washes, and creams. Each is solid at room temperature with different melting points. Learn all about how to use natural body butter here. Swapping traditional glass mason jars for plastic containers is another great method to reduce plastic waste. I use them to store dried herbs from the garden, freshly squeezed juice, and bath bombs and well just about anything! Start with a pack of 12 pint-sized mason jars. Thanks to Epsom salts, bath bombs do much more for our bodies than moisturizing the skin. Named after a small town in England where it is was discovered in 1618, Epsom salts are known for their powerful ability to relieve aches and pains. They breakdown the build-up of lactic acid which causes muscle pain. Add a ½ cup of Epsom salt to your next bath or try them in my recipe for a bubbling lemon vanilla bath soak. Natural waxes like soy, beeswax, and coconut are excellent sources for candles. In fact, you can make a half dozen soy wax candles at home in just an hours’ time all while leaving the carcinogens out! Soy wax is non-toxic, biodegradable, renewable, and cleans up if spilled with just warm water. Combine it with a pack of wood wicks, candle tins, and a DIY recipe for apple blossom soy candles. Yep, we’re talking about rubbing alcohol, isopropyl alcohol, and straight up vodka. Just don’t use your husband’s fancy vodka – go for the cheap stuff! Vodka’s high alcohol content happens to be perfect for killing germs, and even mildew or mold. And all of the above really help shine chrome and glass in addition to killing odors. Plus you’ll find each is antiseptic. I love having fresh herbs within in reach to use in my beauty recipes. Even if you don’t have a green thumb you certainly keep the plant alive long enough to get your money worth or opt for dried herbs. Fresh herbs not only make our homemade beauty recipes smell heavenly, but they also have a multitude of benefits. 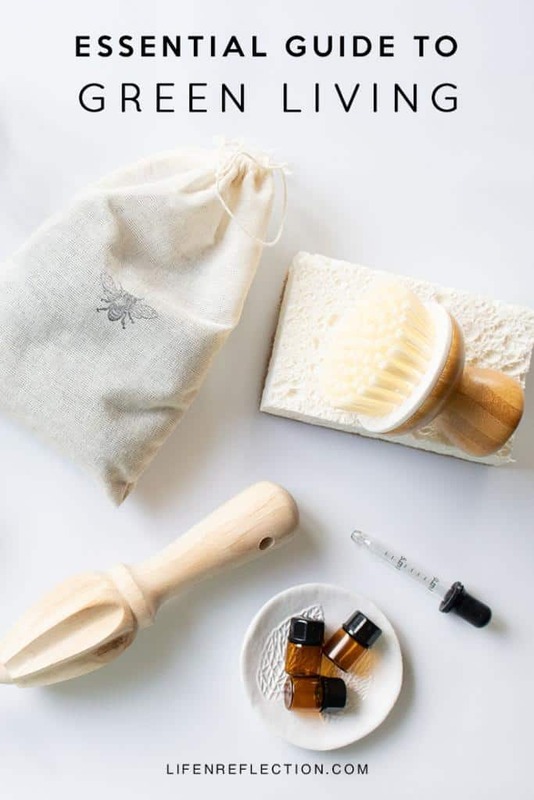 Chamomile, eucalyptus leaves, lavender, and lemon balm are some of the favorites to use. 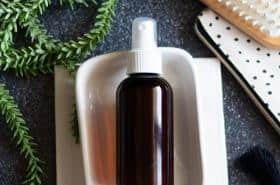 Natural carrier oils can make a big impact on the health and condition of your skin. They are packed with vitamins and antioxidants essential for healthy skin. 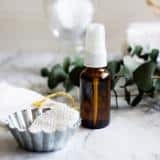 There are a variety of carrier oils available such as apricot kernel oil, grapeseed oil, sweet almond oil, and more – find the right carrier oil for your skin type here. Sal Suds is Dr. Bronner’s tougher version of soap, although its chemical makeup makes it a detergent, not a soap. Sal Suds is formulated to conquer tough cleaning projects such as unforgiving grease and stubborn dirt. And the Environmental Working Group gives it an A. Sal suds is basically a tougher version of castile soap. So, do not use it for skin applications. Goat milk soap base is specially formulated to suspend additives evenly throughout soap. Meaning if you add lavender buds or chamomile flowers from the garden to your homemade soap they won’t sink to the bottom of the soap like it would in other soap base types. It also a natural skin-loving choice for making soaps. Try in my recipe for lavender goat milk soap. This may seem like an odd addition to a green living essentials list, but loose leaf tea is quite handy for natural beauty and hair care. 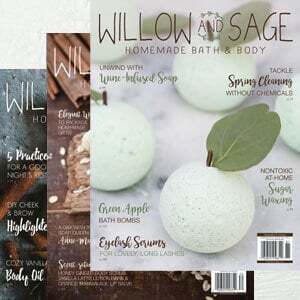 I love to add herbal teas to soaps and bath tea recipes. You can simply drop five tea bags into your bath for quick use or make a rich spiced chai latte bath for relaxing self-care treat. Washing soda, also known as sodium carbonate is extremely alkaline. The high alkaline level works as solvent or water softener to degrease and lift stains. It very effective to fight hard water because it binds to the minerals. Washing soda also helps liquid soap “gel”, making it a multipurpose cleaning tool. Use this handy printable market list to keep track of your green living staples. Grab it and many more printables and reference guides in the Life-n-Reflection Resource Library. Now that you’ve got your market list, you may be wondering what to make versus buying? 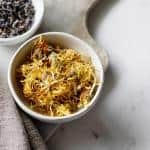 Browse my Natural Skincare Recipes and Natural Home Recipes. 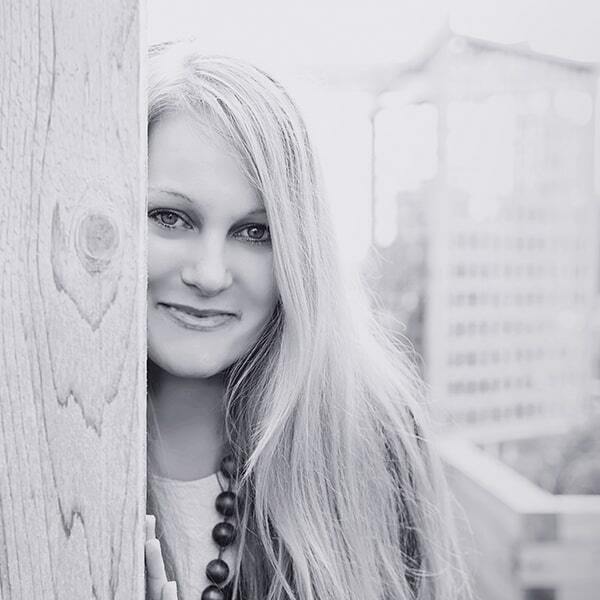 Grab my best selling book Aromatherapy: A Practical Guide for Home and Family!